Sonic and All Stars Racing Transformed finally hits the iOS and Android platforms tomorrow, and mobile players are in for a pleasant surprise. According to the official Facebook page of Sonic the Hedgehog, Sonic finally hits mobile platforms on January 2nd. Amongst the promotional images, one (pictured above) is of particular interest as it all but confirms that Ryō Hazuki of Shenmue fame will be joining the roster on these two platforms. It is unknown at this time how many other platforms he will show up on in the future, although we have already reported on him being sighted in the Yogscast Charity Stream which was the PC version. See if you can pick out all the classic SEGA and Shenmue references he comes with…and perhaps even a little jovial ribbing from Sumo Digital. < Previous Post Previous post: Yet Another Christmas With Sonic, by BalenaProductions! Just thought I’d point out that the licence plate on the car mode says “Shen 3”. 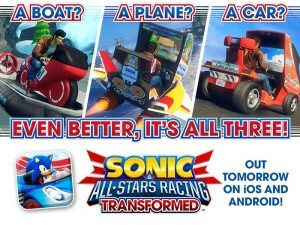 What Ryo is going to be in Sonic & All Stars Racing Transformed for IOS and Android, then PC is tomorrow. Also no game console like PS3 or WiiU, and 3DS, then PSVIA, and Xbox 360 of Ryo Hazuki not going in it? I’m going to be excited about tomorrow when I get this game,but I am curious if there is a way to race online on Android,since I have that. If so Great!,but if not,then oh man. Oh I almost forgot Happy New Years 2014. Oh my bad it’s was yesterday. Hey! Isn’t anybody going to let them know that Sonic and All Stars Racing Transformed for iOS and Android are released today? Hey guys! You better not download this game yet. I downloaded it, but I’m experiencing technical problems. The vehicles, and tracks are black instead of their normal colors. I’ll wait until an updated version is released with all these problems fixed.